Tesco's 2pm reduced aisle sorts out my meals for a week. It’s official; just after lunch is most definitely the best time to hit the shops and the supermarket reduced aisle if you’re looking for bargains. I may not have done the most scientific of research, in that I have just chosen random times to hit different shops but I am almost convinced of this fact. Added to what I’ve discovered through my highly scientific methods, I think there could be a lot of explanations for this proliferation of reduced goods at around 2pm: the lunch time rush is done so staff may be settling down to “other” jobs for the day. Equally, the lunch time rush has weeded out what people do/don’t want so any leftovers can go into the reduced aisle. Finally, most obviously, nobody else has the chance to take what’s there because they’re all at work, huzzah! Not only is the amount and variety available incredible at this time of day but also, it gives you the rest of the day to get it home and pop it in the fridge or freezer to make sure it really isn’t going off. Baby Corn – £1.50 to £1.05. 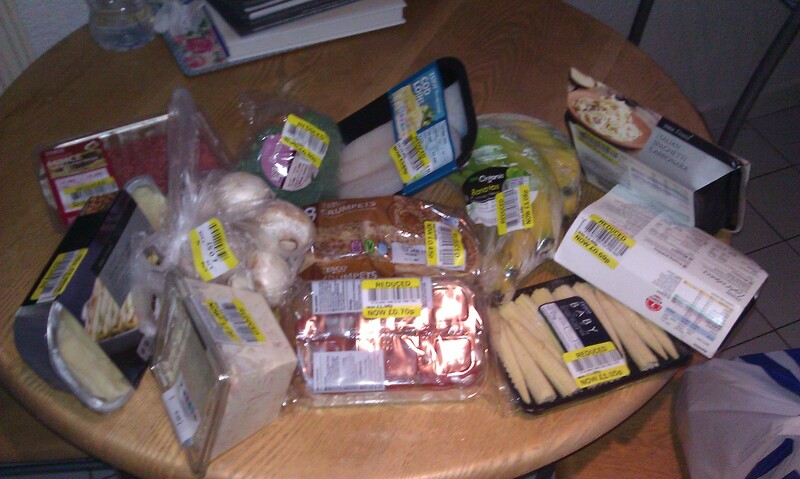 In total, I made a saving of quite literally £8.15 on this little shop. A lot of it was straight in the freezer but look at the array: I’ve got meat, fish, veg and even herbs. What a dream shop! Well I am certainly satisfied that this is the time to hit the supermarket reduced aisles. Let me know if you think any different!